Re-uploading videos on YouTube is a favorite of scammy channels that try to profit from other people’s work. Copyright owners already have a number of ways to protect their content, but today, the service is introducing a new tool that automatically scans every newly uploaded video to check if it’s a re-upload of an existing one or “very similar” to a video that’s already on the site. 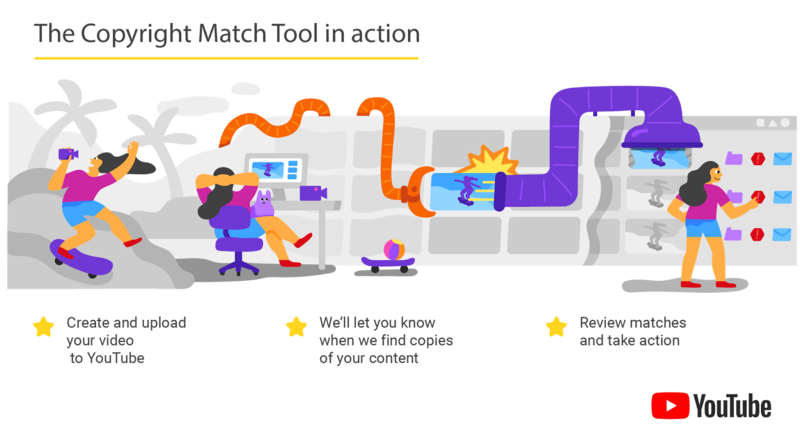 It’s worth noting that this new tool, dubbed ‘copyright match,’ won’t work for clips, only full videos. YouTube also notes that it’s important that the creator is the first person to upload the video because the time of the upload is how it shows matches. When the tool finds a match, the creator can choose what to do. The options here are either doing nothing and feeling flattered that somebody would care about your mediocre cat video, get in touch with the other creator and have a nice chat about what happened, or ask YouTube to remove the offending video (which is probably what most people will opt for). Now a lot of this sounds like YouTube’s existing Content ID program and while it uses very similar technology underneath, the company stresses that this tool is explicitly meant to recognize unauthorized re-uploads. Content ID, however, is mostly meant for the copyright owners of music and music videos, trailers, and recordings of performances. Starting next week, the new copyright match tool will roll out to all creators with more than 100,000 subscribers. The company plans to roll it out to a wider base of users over the next few months.